Gary Beck, vice president of flight operations at Alaska Airlines, testified Wednesday in Washington, D.C., before a Senate subcommittee on aviation. 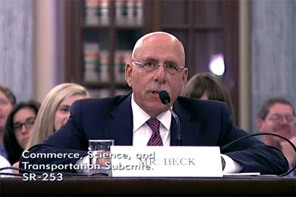 Gary Beck, vice president of flight operations at Alaska Airlines, testified Wednesday in Washington, D.C., about NextGen before a Senate subcommittee on aviation. In the hearing to examine the Federal Aviation Administration’s progress on NextGen, Chairwoman Sen. Maria Cantwell, D-Washington, highlighted the work that Alaska Airlines is already doing. Greener Skies aims to improve the efficiency of flights landing at Seattle-Tacoma International Airport to reduce fuel usage, carbon emissions and noise pollution. While Alaska has begun NextGen arrival procedures at Sea-Tac – “akin to the plane sliding down the banister rather than taking the stairs” – Beck asked for congressional support for FAA rule changes to allow aircraft on curved or straight-in paths to be closer together when approaching parallel runways. Today, aircraft must be separated by 1,000 feet vertically or 3 nautical miles laterally until they are “established” on straight-in final segments to dependent parallel runways. One of the key goals of NextGen is to implement rule changes that allow aircraft to be established on both curved and straight-in paths, allowing for reduced separation between the aircraft of just 1.5 nautical miles diagonally. The key benefit of reduced separation is increased airspace efficiency. Thirteen airports in the National Airspace System would benefit from this rule change. An FAA report on NextGen is due in July. “If the most fuel efficiency is out of this approach issue, then what can we do to accelerate that during this time period while we’re also getting the larger cross-navigation system replaced?” Cantwell said at the end of the hearing. 1. Approve the FAA rule change for “Established on RNP.” The FAA rule changes that follow from the “Established on RNP” waiver are crucial to NextGen implementation. Roadblocks exist in this space, in many cases understandably. But approval of the rule change is a necessary first step to ensure the beneficial impacts of NextGen. 2. Publish and implement the amended RNP approach procedure. Though the approach procedures were published in 2013, they are not fully used – with the notable exceptions of the Denver and Portland airports. These procedures must be amended and fully implemented. Alaska currently foresees a minimum two-year delay from initial publication, which further stalls the benefits of NextGen. Additionally, continuity in the teams developing these procedures will reduce the time to implementation. 3. Support an FAA post-implementation benefits analysis of the Greener Skies initiative. It is important that there be have verifiable data on the benefits and impact of the Greener Skies initiative. Alaska Airlines has begun culling that data on its own, but the airline is asking the FAA to take a leadership role in developing a benefit analysis in order to validate the metrics Alaska uses to measure the impact of Greener Skies. 2 comments on "Alaska VP asks senators to support extending NextGen ‘all the way to the runway’"
Current noise abatement corridors at SEA for approaching planes during north flow follow a narrow path, but right through three densely populated hill neighborhoods of Seattle (beacon hill, capitol hill, first hill), plus more. Those living directly under the flight path will be experiencing increased frequency of flights right overhead, with the decreased spacing and more precise navigation. Surely, they will perceive an increase in noise and disturbance. Please don’t lose touch with the people who will be negatively affected by these changes! I don’t want to discount the many benefits of this initiative, but I’m sure there are alternatives or tweaks which would benefit everyone. There’s been quite a bit of “Greener Skies” and NextGen information provided about Seattle (north of the SeaTac airport), but I can’t find anything mentioning NextGen about the areas to the south of SeaTac airport. The residential core of Federal Way is terribly impacted by jet noise. How might a changing NextGen or Metroplex “preferred” route help or hurt the forgotten residents of Federal Way having a 98023 zip code?